Formula One leader Lewis Hamilton seized pole position for the Belgian Grand Prix in a chaotic wet qualifying session on Saturday, with Ferrari title rival Sebastian Vettel alongside on the front row. French driver Esteban Ocon secured a sensational third place on the grid for Force India, who are starting afresh under new ownership, with his Mexican team mate, Sergio Perez, fourth. With the rain coming down just before the top-10 shoot-out, and then easing off again, the typically capricious conditions proved a nightmare for some while others cashed in. The pole was Hamilton’s fifth at Spa — a record — and 78th of his F1 career, but it was touch and go on a drying track with the clock ticking. Slipping wide and across the grass runoff, the champion left himself just one final shot at a flying lap before the time ran out — and he nailed it. “It was one of the toughest qualifying sessions I can remember,” said Hamilton, who won from pole in Belgium last season and is 24 points clear of fellow-four-times champion Vettel with nine races remaining. “We were very close. I was hopeful. Ferrari were very quick on the straights, then the rain came and I can’t stress how difficult it was. Sunday’s race looked set up to be a battle between the two great rivals, with Vettel possibly having the faster car, after a qualifying that shook up the grid beyond the two championship contenders. Vettel’s team mate, Kimi Raikkonen, a four-times winner at Spa, starts only sixth after being caught out in the pits while Mercedes’ Valtteri Bottas will line up at the back due to accumulated engine grid penalties. The Red Bulls of Max Verstappen and Daniel Ricciardo qualified seventh and eighth after also getting their tactics wrong. “It got drier at the end. We had done our laps at the beginning, thinking it was going to get worse, so we were just unlucky, I guess,” said Ricciardo. Taking advantage of the drying track, surprised Frenchman Romain Grosjean put his Haas in fifth place behind the Force India pair. Vettel and Raikkonen had both earlier shattered the Spa circuit record, banging in laps of one minute 41.501 and 1:41.627 respectively to better the 1:41.770 set by a Porsche 919 world endurance car in April. 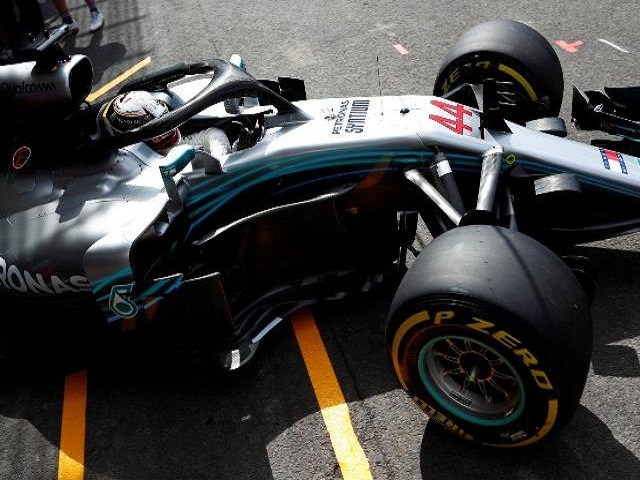 The red cars had also led every practice session and appeared to be set for a one-two on the grid, a situation that would have left Mercedes on the back foot and Hamilton contemplating damage limitation. Hamilton’s pole time was a comparatively slow 1:58.179, with Vettel managing 1:58.905. “It was a bit chaotic and not great from a management point of view,” Vettel said. “I don’t feel we put everything together in the last lap. We ran out of battery. While Mercedes and Ferrari could look forward to another big battle on Sunday, there was more misery for former champions McLaren and Williams, whose drivers were the slowest on track. Belgian Stoffel Vandoorne, whose days at McLaren appear to be numbered, was slowest of all, while Fernando Alonso was 17th fastest. “We’ve lost a bit of performance in recent races, but on top of that we knew Spa would be quite a difficult race for our package in terms of performance, and so will Monza,” said Alonso, who will be leaving F1 at the end of the season. “We will try to defend here and attack on more favourable tracks,” the double world champion added.